Navras Jaat Aafreedi, a professor at Presidency University in Kolkata, is a scholar-activist who constantly champions Jewish Studies in India. He is indefatigable: he organized a multi-site Holocaust film festival, serves as advisor to a student theater group, and travels and speaks widely on several continents. And yes, he also does good scholarship. His new, small book is notable for its innovative breadth. This work begins with a brief chapter on the well-known and much-studied Kochi (Cochin) Jews, the Bene Israel, and the Baghdadis. It is a reliable summary of work that serves as a fine introduction to the study of Indian Jews. The second chapter is about Judaizing movements, the relatively remote groups who claim Jewish identity. Aafreedi discusses the B’nei Menashe, tribals along the Indo-Burmese border who about 50 years ago began asserting their claim to Jewishness and have learned Judaism and Hebrew, have synagogues and miqva’ot, and are in the process of making aliyah. He also looks at the B’nei Ephraim, much less well-known than the B’nei Menashe, who live in very humble circumstances in a number of villages and towns in Andhra Pradesh. They try to use Hebrew in daily life as they begin to study about Judaism. And there are also the Chettiars of Tamil Nadu who, like the other two Judaizing movements, came to Judaism via Christianity, and unlike the other two, do not claim Israelite origin. Their movement began in 2011 when about 1,500 congregants of the Zion Gospel Church abandoned Christianity for Judaism under the leadership of a charismatic leader. Much of the second chapter will be news to many readers, but it is in the third chapter that Aafreedi truly breaks new ground. Here, he explores the theme of non-Jewish groups who claim Israelite descent as well, but have no interest in being considered Jewish. Many of them are Muslim and include the Pathans, about whom Jewish identity has been claimed for more than 100 years, and Kashmiri people who were first identified as Jews in a 9th-century travelogue. Fortunately, Aafreedi reads Urdu and has access to writings unknown outside a few interested people in India. 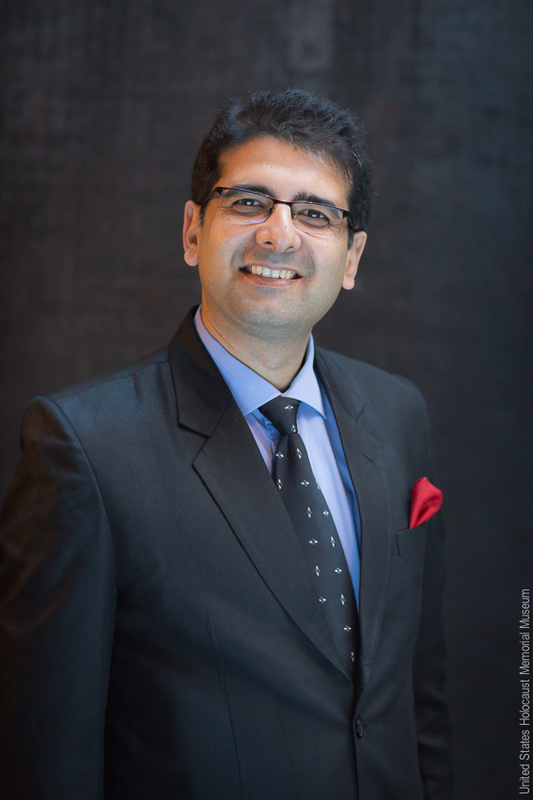 As Aafreedi is himself a Muslim, he also has personal access to the groups he studies. This is the greatest contribution in this work. India also has Christians who claim Israelite ancestry. Kerala is home to many, most notably the Nazaranis (very much akin to the Mar Thoma, or St. Thomas Christians). These groups claim a 2,000-year history in India, some tracing their origin to the missionary visit of St. Thomas in the first century. Chapter 7, “Jewish-Muslim Relations in South Asia,” is fascinating. Again, Aafreedi has marvelous access to his sources. The chapters on “Synagogues in India,” “Jews in Indian Cinema,” and “Jews in Indian Literature” are interesting. While this material will be new to many readers, to those more knowledgeable will find little new material. The final chapter, “Indian Jewry in Israel,” mostly surveys work by Joan G. Roland and Joseph Hodes, but makes a fine capstone for the book. Author's bio: Nathan Katz is Distinguished Professor, Emeritus, at Florida International University, where he was Director of Jewish Studies, the Bhagwan Mahavir Professor of Jain Studies, Kaufmann Professor of Entrepreneurship, Founding Director of the Program in the Study of Spirituality, and Founding Chair of the Department of Religious Studies. Currently, he serves part-time as Academic Dean of the Chaim Yakov Shlomo College of Jewish Studies, an Orthodox rabbinical school in Surfside, FL, and serves on the faculties of Sivananda Yoga Ashram Resort on Paradise Island, Bahamas, and Hindu University of America in Orlando, FL. - Journal of Indo-Judaic Studies, No. 16, 2018, p. 80. The title of the book, Jews, Judaizing Movements and the traditions of Israelite Descent in South Asia is a misnomer, as the book is really a wide-ranging group of essays about the Jews of the Indian subcontinent – mostly India but with a few references to Pakistan. The essays underline the physical, material and cultural presence of the Jews in this region and the way in which Judaism has been part of the cultural imagination for centuries. The three well established Jewish communities of India are discussed, as are those communities that see an affinity of descent or culture with the Jewish people. It is clear that from Kashmir to Kerala and from Mumbai to Kolkata, the Jewish presence is embedded in the subcontinent’s cultural and mythical heritage. Aafreedi, himself, clearly delights in India’s Jewish heritage. Where relevant he draws attention to the close affinity that did exist between Muslims and Jews in the region. The book opens with a useful, if eclectic, chronology of Jewish engagement with India from 721 BCE to 2005 underlining their continuing presence across India’s varied geography. The first essay provides a brief overview of the origin stories of the Bene Israel, Cochini and Bagdadi Jews. 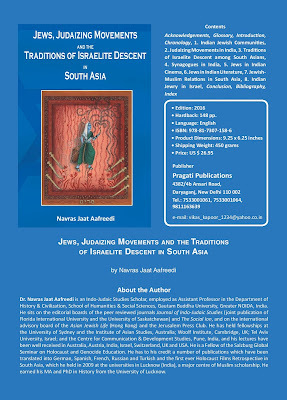 Two essays, Judaizing movements in India and traditions of Israeli descent among South Asians provide a brief overview of the three Judaizing movements in India – the B’nei Menashe of Manipur, the Bnei Ephraim in Andhra Pradesh and the Chhetiars in Tamilnadu. Three essays deal with the various synagogues in India, Jewish contributions to Indian cinema and literature. The Israelite traditions among certain Muslim groups in the subcontinent that has existed over the centuries makes an interesting addition to our understanding of how the Jewish presence was manifested among several communities across India. The final essay extends the scholarship beyond South Asia to analyze the ways in which the Jews of India have resettled in Israel. Two of the three Judaizing movements he describes are based on claims of descent from the lost Israelites. A twenty-first century movement in Tamilnadu is premised on the belief that Judaism is the true religion. All three of these movements have emerged among Christian communities. The Bnei Menashe dates back to 1936 when the revivalist Saichunga declared Mizos were one of the lost tribes of Israel. Through their interactions with Rabbi Avinchail, who was dedicated to the search for the lost tribes of Israel, the “return” of the Bene Menashe to Israel was made possible. 125 families of the Madiga of the Guntur district in Andhra Pradesh, identify as Israelite. Their interest stemmed from their leader, a Christian preacher attending a Conference of Evangelical Christians in Jerusalem. It stirred his interested in Judaism and he introduced elements of his religion to his community who also see themselves as part of a Lost Tribe. However they represent themselves as a scheduled caste, a Hindu category. Finally he introduces the Chettiar community of Erode in Tamil Nadu, where 1500 congregants of the Zion Gospel Church abandoned Christianity for Judaism in 2011 under the leadership of their pastor. Continuing with the Judaizing theme, Aafreedi describes the scholarly interest in the older tradition of claiming Israelite descent primarily among Muslim groups but also among the Kenanya, belonging to the Syrian Orthodox Christian Church. The Muslim groups include the Kidwai/Qidwai and the Bani Israel trace their descent from Jews and Pashtuns and some Kashmiris claim descent from the lost tribes of Israel. However, like the previous essay while Aafreedi covers a great deal of ground in terms of scholarship, he does not offer new analysis nor does he seek to theorize these movements. The next three essays deal with the synagogues in India, Jews in India cinema and their contributions to literature. The short article on synagogues covers the synagogues of the Bene Israel, the Cochinis and the Bagdadis in one essay and includes information on the styles of the various synagogues as well as a listing and description of the synagogues of each community. In the spirit of inclusion and in embrace of India’s Jewish past, Aafreedi calls for the importance of their preservation. In his essay on Jews in India cinema he highlights the stars from both the Baghdadi and Bene Israel community and includes Pearl Padamsee, though he does not provide much information on her Jewish past. He also pays tribute to the film journalists, film-makers and historians, who were Jewish including Ruth Prawer Jhabvala, a European Jew, as India’s only academy Award winning screen writer. In his essay on Jews in literature he chronicles the writers that are mostly from the Bene Israeli community and includes Sheela Rohekar the only Indian Jewish writer who writes in Hindi. In this essay both the writers and some of their works are discussed. In his concluding essays he discussed Jewish-Muslim relations and notes that there has always been a degree of antipathy towards Jews among the Muslims in the region though “..it never acquired the proportions so as to emerge as the menace of anti-Semitism, until the creation of the modern state of Israel in 1948.” Yet he writes of how anti-Semitism and anti-Zionism have intertwined among South Asian Muslims in some violent ways such as the attacks on Jews in Karachi in 1948, 1956 and 1967 and the murder of Daniel Pearl in 2002, the Pakistani attack on Beit Chabad in Mumbai in 2008 and the explosion of an Israeli diplomat’s wife’s car in Delhi in 2012 by Iranians. These attacks have occurred, he laments, despite South Asia having produced some of the best examples of Jewish-Muslim amity that he narrates. Some of the original sources he uses for this essay include two articles denying the Holocaust that appeared in the Urdu language daily newspapers Roznama Rashtriya Sahara and Aag. He also referred to the writings of Syed Abul Hasan Ali Nadwi, Founding Chairman, Trustees of the Oxford Centre for Islamic Studies and Rector Darul Uloom, Nadwatul Ulama, Lucknow and Maryam Jameelah, one of the greatest ideologues of Jam'at-i-Islami. In his final essay he discusses the various forces that led Jews to migrate to Israel that differed considerably across the three main Jewish communities of India and the challenges of acceptance they faced when they emigrated. The book provides an unusual set of perspectives to view the Jews of India and those who claim affinity with Israel or the Jewish faith. Aafreedi’s essays clearly make the case that though the Jews were few in number they have always been embedded in the material and cultural imagination of the subcontinent. Professor Jael Silliman was a tenured Associate Professor of Women’s Studies at the University of Iowa. She was also a Program Officer at the Ford Foundation, New York, for Reproductive Rights and Justice and subsequently the Women’s Rights Portfolio. She is the author of several books, scholarly papers and popular articles on gender, development, race, social justice and women’s rights issues. She also writes about her community, the Bagdadi Jewish community. She is the author of Jewish Portraits, Indian Frames: Women’s Narratives from a Diaspora of Hope, a novel The Man With Many Hats and most recently The Teak Almirah. She is the curator of www.jewishcalcutta.in . She is now an independent scholar and writer and spends much of her time in Kolkata.